The beautiful Rose Gold collection by Nomination is a fabulous new addition to the popular stainless steel composable collection with new links in 9K Rose Gold, embellished with Cubic Zirconia, Enamel and Semi-precious stones. 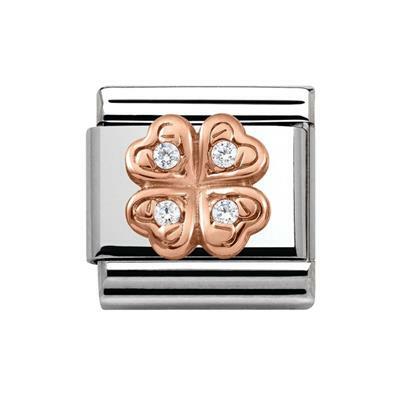 This classic charm has a raised rose gold lucky four leaf clover encrusted with white cubic zirconia for a sparkling addition to the rose gold collection. Start a new rose gold bracelet and wear it with your gold or silver Nomination bracelet for a stylish combination.